Too many councillors in Montreal? An argument that has been circulating in the media lately is that Montreal is “over governed” because it has too many elected officials. 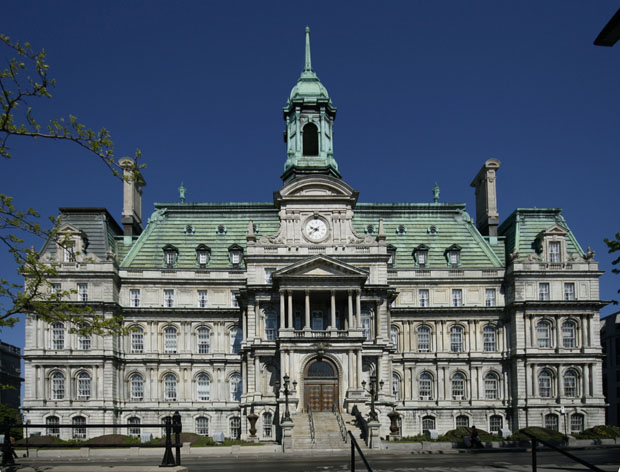 Various commentators and organisations, such as the Board of Trade of Metropolitan Montreal, have come out in favour of reducing the number of city councillors. The eccentric Michel Brûlé, editor and possible long-shot mayoral candidate in 2013, has proposed to reduce the size of the Montreal council to “no more than 30”. All this talk of too many councillors also seems to have some echo amongst the general public: a poll released at the end of last year shows that an impressive 65% of Montrealers agree with the statement that Montreal has too many elected officials. So how does our City Council actually size up when compared to other major cities around the world? When up against many English Canadian and American cities, our 65 member council (103 including borough councillors) looks huge by comparison. Los Angeles has only 15 city councillors, despite being having over twice the population of Montreal. New York City has 51 councillors, a number comparable to ours, but the city also has five times our population. These are numbers that smaller council proponents are fond of bringing up, but it’s only half the story. Once one leaves North America, the trend reverses. Go to France and you’ll see that most municipalities have large councils. The Conseil de Paris has a whopping 162 members; and this doesn’t include their hundreds of borough councillors. Go to the Berlin regional parliament and it’s a similar situation with 149 councillors for a bit more than twice the population of Montreal. And like Montreal and Paris, Berlin also has a two-tier system with hundreds of borough councillors. But of major European cities, it’s Stockholm that gets the prize with 101 city councillors for a population that is half of ours. So when all of this is considered, one can see that Montreal is actually in the middle of the pack, not way out in the front. Below is a comparison of the situation in a few different cities across the world. 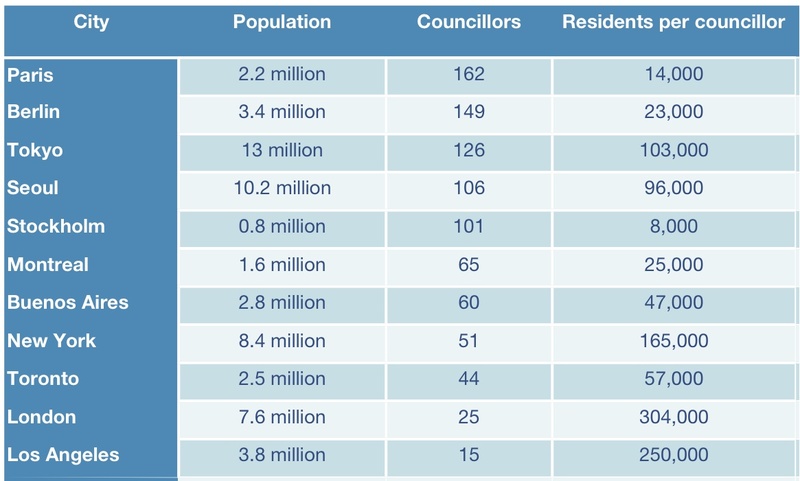 The far right column shows the number of residents per elected official, since 50 councillors means something very different in a city of 1 million versus a city of 10 million. So any objective analysis of the data should put to rest the idea that there is something fundamentally wrong or unusual about the size of the Montreal City Council. So why then does the “too many councillors” argument continue to gain traction? The idea that “two many politicians” makes for bad governance is not new, and has actually been circulating for some time amongst right-wing populists. Former Ontario premier Mike Harris reduced the Ontario legislature from 130 to 103 seats in 1999 as part of his “Common Sense Revolution”. Current Toronto mayor Rob Ford also campaigned on halving the size of the Toronto City Council. Closer to home, during our last municipal elections right-wing also-ran Louise O’Sullivan also promised to halve the number of city councillors if elected. This fixation stems from a conflict between two fundamentally different ways of viewing local government. One paradigm sees local government as an apolitical purveyor of services. It’s not a space where differing ideologies and interests compete to influence the development of the city; it’s a corporation that builds roads, collects garbage, and maintains public order. As such its work is not political, but rather administrative. In this mindset, the logical decision making structure to draw from is corporate governance, with the city council serving as a sort of board of directors. Orthodox management theory says that for maximum efficiency and rational governance, decision making should be keep within a relatively small number of people, perhaps around ten to twenty. In municipal government this translates into a small number of councillors who are more trustees, managing a corporation in the public interest, than actual representatives. It’s a traditionally Anglo-Saxon model for local government, which explains its prevalence in North America outside of Quebec. The other paradigm sees local government as being inherently political, like any other level of government. While many local government dossiers are non-contentious, this model admits that there are bound to be ideological disagreements that can only be solved by duking it out in the public arena. In this mindset, the logical structure to draw from is that of a parliament. It might be messier, but only a large deliberative assembly could hope to represent the wide range of opinions and interests in a populous metropolis. Moreover, having a lower population to politician ratio means citizens are more likely to have direct access to their elected officials. This is the model that Montreal uses, as well as most of the non-Anglosphere West. While proponents of a smaller council claim it would be a common sense change to promote good government, it’s actually part of a political project based on a right-wing, small-state mentality. It has little to do with improving local government for average Montrealers, and more to do with its proponents’ knee-jerk, ideological opposition to our current parliament-inspired model. All this is not to say that everything is fine in Montreal and that our current political structures are above criticism. But it’s important to identify real problems and strive to develop real solutions, instead of wasting our time talking about red herrings. I do wonder about your figure of 65 councillors. Does this include borough representatives, meaning those who sit only on the conseil d’arrondissement? In fact, it has everything to do with improving local government for average Montrealers. The fact that you dismiss anyone who honestly believes that a “small state” is actually honestly better for society as some kind of shallow knee-jerk automaton that isn’t interested in “real solutions” clearly shows you are biased, and, (using your knee-jerk language), a big-state left-wing idealogue. Thanks anyways for pointing out that Montreal has by far more councillors-per-residents than any other city, second only to Stolkholm in your list. Dennis what it sounds like your saying is that people who disagree with the ‘prevailing opinion’ that we have ‘too many politicians’ should simply not express that disagreement? Conflicts are bound to exist because everyone doesn’t agree with everyone else. Frankly telling people to essentially shut up if they won’t simply say, “I agree to disagree” is also pretty ridiculous. @ Iain : 65 is the number of people who sit on the city wide council. This includes the mayor of Montreal, 18 borough mayors, and 46 city councillors. There are also 38 borough councillors, which bring the total up to 103. Looking at only the city wide council does deflate the numbers, but this is something that I do uniformily. Of the cities compared Paris, Berlin, Stockholm, Seoul, Tokyo, and London all have equivalents of borough councils that would boost their numbers if included. Paris would probably be something around 350 and Berlin over 600. @ Dennis : I do have leftist sympathies and I am favourable to many types of state intervention. This isn’t something I attempt to hide. But most people who promote reducing the size of council use dishonest arguments and attempt to present it as common sense instead of part of an ideological project, yet they offer no evidence to support their position. I have never seen any attempt to actually demonstrate that there is a connection between more councillors and more waste, corruption, inefficiency, etc. Is Berlin’s government any more disfunctional that Montreal’s because of its 149 councillors? Is Detroit any better governed because it only has 9 councillors? I have yet to hear a convincing case that there is even the least correlation. Also, of the cities on my list not just Stockholm but also Berlin and Paris have proportionally more councillors-per-residents. And as I responed to Iain, when taking into consideration their borough councillors, Paris and Berlin have far more elected officials than we do. Once we no longer have to wait a ridiculous 11 minutes for a packed-like-sardines green or orange line train on a Friday or Saturday night, and no longer have to drive & cycle on roads that are in worse condition that the surface of the moon, then we can talk about justifying a huge civic government. Fact of the matter is we just don’t get what we pay for; we’re being robbed blind. @Marc : I agree with you on the poor STM service and road condition. Maybe having a smaller government would help. But elected officials are only the tip of the iceberg. Even if you include demerged cities, there are about 200 councillors on the island… or 1% of the 20 000 or so public servants working for the city. And they are not the best paid, by far : a city councillor earns $ 49000, a borough councillor, substantially less. They are more visible, but even if you cut their number in half, you save less than half a percent of the payroll. @David, no, that’s not what I’m saying at all. What I am saying there are good honest and sincere people who seriously think reducing “government” to get out of unwilling people’s lives is the way to go, and others (I guess :b) who honestly want a nany state to hold them by the hands — and that, quite contrary to what you said, *both* people should be allowed to live the way they choose, as much as possible. And, more to the point, I honestly doubt that the best possible way to accomodate such diametrically opposing views is to either have the entire island (willing or not) obey the edict for more (co politicians, or vice versa. I don’t think it takes a phd to figure out at least a slightly more satisfying arrangement. @Devin, the main “common sense” argument you are probably referring to is that people actually don’t like being told (by you, etc) what to do, if it can at all be avoided. It’s a matter of “common sense ethics”. I’m not sure how much you’ve thought about the issue, but you do realize that “state intervention” equates to violence against innocent/unwilling people? The question should not even be about “efficiency” (however you define the term), even though it’s generally accepted that voluntary interactions generally lead to optimal organisation, but first and foremost about *ethics*. If violence can be avoided, regardless of how much more potentially efficient the violent solution might be, it must be avoided. I think that you need to include all elected representatives who have a hand in controlling spending of public funds raised through municipal property taxes. In Montreal, that would include not only borough councillors, but school board commissioners as well (in New York, for example, the public school system is controlled by the mayor and accountable to city coucillors). On the Island of Montreal, there are 6 school boards, each with 20-25 elected commissioners each. The budget of English school board’s alone is about 10 times that of the Plateau Borough alone. As an elected commissioner, I have found that elected officials often find themselves in competition with administrators when it comes to setting policy. A little while ago, Spacing Ottawa looked at the New Hampshire house of representatives, which consists of 400 reps, for a state with a population much smaller than that of Montreal. Each rep receives an honorarium of $200 and works part-time, with the objective (the author suggets) of serving the public good rather than being career politicians. @Patrick I’m actually not sure what reducing the number of elected representatives has to do with state coercion. If we wanted to reduce that kind of state power we’d be reducing the number of police, downsizing the municipal court, etc. In fact, what you are saying sounds like an argument for some of anarcho-syndicalist form of municipal ‘government’. In such a case we might actually want more representatives, or none if we go as far as direct democracy. If not, please clarify what you think the connection is between a large council and state coercion. As far as ‘living and letting live’ goes, I suppose you realize that enforcing private property rights is a form of state intervention, quite violent in some cases. Are you suggesting that people should be able to choose whether or not to be subject to that kind of state intervention? Are you saying that everyone should be to do whatever they like? It all sounds fine until one actually starts to think about the details. Everything in Quebec can be ‘leaner.’ That includes Montreal’s governance structure. No one wants or needs thick bureaucratic systems – even social democracies. We talk about Montreal’s immobilisme, well, this issue of councillors is all part of the same problem: our culture of bureaucracy. How can you call Michel Brule an eccentric. He is a racist, but since its anglophones he disses ,he’s an eccentric. @Jack : I decided to call him an eccentric based on interviews I’ve seem with him. I have a viscerally negative reaction to him; he seems to be way off the mark on most issues, and he also has a tendancy to fixate on weird distractions, like laws on public consumtion of alcohol. At first glace it looks like he’s a joke candidate, but he acts like he’s serious. I haven’t heard any explicitly racist comments coming from him, but I wouldn’t put it past him. Do you have any links to documentation? Je suis étonné que personne ne fasse le lien entre la taille (et la structure) de la bureaucratie municipale, et l’aberration électoraliste que furent les défusions municipales. @Delvin: Si une certaine grogne populaire existe face à la taille de l’appareil municipal montréalais, je ne crois pas qu’elle provienne tant d’une comparaison avec d’autres villes canadiennes que de la perception que quantité de postes décisionnels et de structures alambiquées ont été créés dans une tentative maladroite de faire plaisir à tout le monde au travers des fusions/défusions. L’administration municipale actuelle est structurée autour des nécessités électorales des gouvernements provinciaux qui les ont réalisées, la bourde ultime étant sans doute celle de M. Charest lorsqu’il réalisa les défusions. Je crois qu’on a pas fini de souligner l’immensité de cette gaffe, et ses conséquences sur l’efficacité de l’administration municipale. Your argument for a parliamentary-style system falls apart because you overlook the executive council. There is no debate on any matter of importance within any council meeting for the city as a whole. All matters are decided upon behind closed doors by an elite group of 12. Never is heard a dissenting word in council chambers. Montreal councillors — all 65 of them — are for all practical purposes a rubber stamp that offers the illusion of participatory democracy, and you fell for it. Calling for useless councillors to be eliminated isn’t a knee-jerk ideological move. It’s a demand to strip away the illusion of public representation and replace it with something functional.